I've been making money through blogging since I started blogging back in 2012. I still remember the first day I received my first email from someone wanting me to place their banner in my sidebar for £50 I couldn't believe it and jumped at the chance! I, the same as many others didn't realise that you could make money from this hobby of mine. But over the years its become much more than a hobby, it's also my job and it's one that I love! I often get questions from new bloggers or bloggers who are looking at maximising their income from their blog so I thought I'd put it all into this post to share with my readers too. 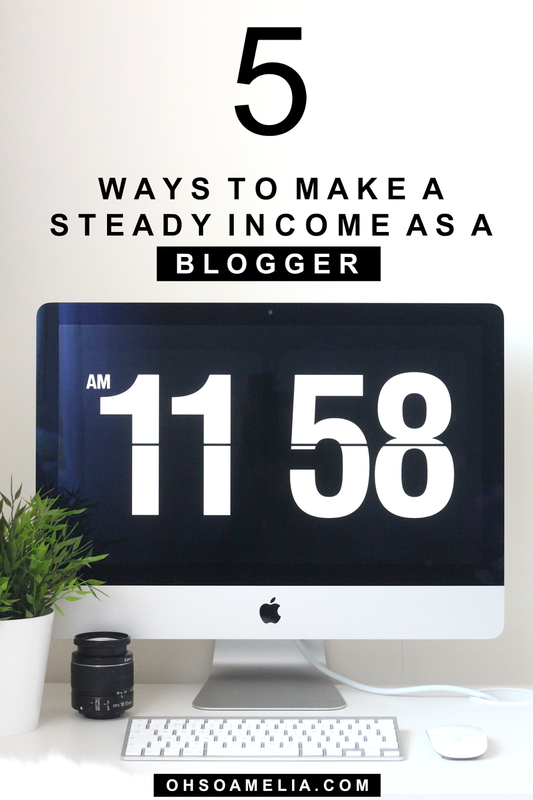 So, here are 5 ways that bloggers make a steady income from their blogs and how you can too! A sponsored post is a post on a blog which is paid for by an advertiser. Up until about a year ago sponsored posts were my main blogging income, that was before I dabbled in other ways to earn money blogging. I'm pretty honest when it comes to talking about money and I will admit that back in the day I did accept posts for as low as £50. The lesson I've learned over time is not to undervalue yourself or your blog and sometimes it's better taking on less posts for more money. Previously I would earn around £2000 a month in sponsored posts but this would be varied from £50 to £200 a post. Now I have a set amount where I won't accept any lower than my set rate which means I have less work to do each month but earn more than I did previously when I had more sponsored posts to write. Below are some places you can start looking for sponsored posts if you're just starting out. These days I get emailed sponsored post opportunities but it's always good to be signed up to a few networks as sometimes they can pay really well! + Pay well if you find the right clients. + You can negotiate on price - remember it's okay to say no too! When writing sponsored posts make you stay true to yourself and stick to your niche. If you blog about weddings it would be strange to start talking about gaming for example. They may be paying well but your posts need to be relevant to your readers otherwise they'll start to loose interest. Affiliate marketing is a great way to make money blogging. Most bloggers believe that you need to be receiving hundreds of thousands of page views a month but that's really not the case. I know bloggers who have around 20,000 page views a month and earn over £1000 a month in affiliates and I know bloggers with 100,000+ monthly page views who earn around £100 a month in affiliates. So as you can see it really doesn't matter if you have a big following its all about having loyal readers who are interested in what you are talking about. Affiliate marketing is one way of monetising my blog that I have been concentrating on a lot more this past year and I have seen some amazing progress especially since taking Michelle's Making Sense Of Affiliate Marketing course. I've seen my affiliate income tripple over the last couple of months. The course costs around £150 but I have already made that back just from one affiliate programme. The idea is to only promote products you truly believe in and use yourself when you apply to affiliate programmes. Make sure you fully disclose to let people know that you are using affiliate links (mine is in my sidebar, but I also put it in my post too). I use affiliate programmes on Oh So Amelia in a few different ways. I insert links to retailers in posts for example reviews, gift guides or where I am talking about a certain product or service. + Great for niche blogs. + Potential to earn you a lot of money. + Long term passive income. + You’re free to promote affiliates as much (or as little) as you like. - May require a lot of pushing to make sales. - Not every program is a good fit for every blogger. - Not all programs are available in every country. Affiliate programmes you can sign up to: Amazon Associates, eBay Partner Network, ShareASale, Commission Junction, Affiliate Window, Ebates, Skimlinks, Linkshare & Affilinet. Go back through your most popular posts and see what recommended products or services would be a good fit. Then update your post, create a new pinnable image and start promoting it! Ad banners from advertising networks are an easy way to monetise your blog, but probably not your most profitable opportunity. In most cases these pay you per click, some are higher payers than others. Google AdSense is probably the easiest to get started with and has a simple dashboard to navigate. You can start to earn money instantly get paid on the 24th of each month if you reach the £60 threshold each month. Read more about how to earn money with Google AdSense here. If you have 1,000 page views or less a day I'd recommend signing up with Adsense. Test and tweak the ad placement and see which size ad works best for you. Some people say not to bother with ads until you have a few thousand views per day but I completely disagree. It can be motivating to earn a couple of pounds from ads everyday and it soon adds up. If you are getting more than 1,000 page views a day it's time to start applying to other ad networks. I'd recommend keeping track of what networks you sign up to, login info and how much you earn each month in a spreadsheet so you don't loose track. You can always sell banner ad spaces yourself instead. There are various ways to do this, via ad networks or you could pitch to a client. The majority of my direct sidebar advertisement banners are from clients who have emailed me asking to promote one of their clients on my blog, however I have also sold ad spaces by asking clients who I am already working with if they are looking to purchase ad spaces so it doesn't hurt to ask. The great thing about selling direct ad sales is the fact that you get to choose how much you sell the ad space for and for how long you want to place the ad, for example 3 months, 6 months, 12 months. I'd also recommend asking for payment upfront if they purchase a selected time period to display the ad. Ad sale advertisers: BuySellAds, Passionfruit Ads, BlogAds. Pitch to a potential or existing clients and tell them why they should place a banner advertising their brand or product on your blog. Sell what you can offer them in return and provide a rate card with your fees, perhaps even offer them a "discount" if they purchase more months advertising. Provide one-on-one expert consultations for a free on Skype or via email. Having an eBook or course is great because it’s a one-time investment of time and effort to create the product and get the shopping cart set up, but the potential payoff is limitless. Well there you have it guys, my top 5 ways to make a steady income as a blogger! Do you do any of these already or have any other ways to earn money as a blogger to share? I'd love to hear below! If you're just getting started or want some more blogging tips, check out my blogging tips library. This is so so helpful. I know of a few of those, but the ad networks on here and direct ad selling is so key! I need to really take some time to go through this and think about my plan. I'm so thankful for your help here though - this is perfect! Have the best week lady! Ohhhh thanks for this post. I'm still far from a point where I can think about monetizing my blog but I hope to get there someday and get it right when I do. I did try Adsense but was denied. Eeek. So we'll see on that front. Great tips! Finding the right affiliate links for your blog is so important. I tried so many before finding success! We're just getting started on this blogging journey and we're so grateful for articles like this! Thank you for breaking it down so simply! WOW this is so amazing..most of them I knew but not in detail like you have shared...I so struggle with making money on my blog..Ive been at it two years and not making hardly anything..its so hard to balance it all with working a job. When I try to make time to pursues these.then I have to spend time promoting my blog on social media and commenting to show engagement....its a constant struggle...thanks for sharing I sure wish I could figure it all out! Just a heads up, Mode went bankrupt this month so you may want to exclude them from your list. I love using sponsored posts and affiliates as my main forms of advertising. Ahh thank you, I did wonder why the website wouldn't load but just thought they were updating it. Some fantastic tips here, thank you for writing this. One thing I would add is that bloggers aiming to make money need to be very sure of the law around this, because people WILL ask you to do things which are illegal and unethical. One of the networks on your list offered me money to write about and link to a client, whilst making it look as natural as possible and not disclosing to the reader that it was a sponsored post. They are by no means the only ones who do this, it happens with depressing regularity. I always decline, because I think it's lying to the reader, and I know it's illegal. But the fact that I get asked repeatedly suggests that some bloggers are agreeing to this. Maybe they don't know that it's against the law, or maybe they just don't care and need the money. Whatever, I can't get too hung up on how other people run their blogs. You have to decide where your line in the sand is, and stick to it. Thanks for this -- it's a nice, comprehensive list. I feel like having a product/service takes the most work, but in the end makes you the most money. What do you think? I love this post! It's more informative than the general list I'm used to seeing. I really want to check out Michelle's course. I've followed her for years and seen her succeed past her wildest dreams and it's so inspiring! I make the majority of my money through sponsored posts, but would love to up my affiliate marketing game! I'm so confused at how to make it work for me when I feel like I'm doing it right! So frustrating! Omg this is absolutely amazing! Thanks for all the resources definitely helpful! Thank you so much! This can be a real challenge. I appreciate you including resources and tips. I bookmarked this one! I found this so useful and thank you for adding websites where we can find sponsored posts! Really helpful. Such amazing tips Thank you!!! Thanks for such helpful content Kerry. I have it half finished off. I really want to get started on this properly. It's hard though when you have a full time job on top of it. This was really useful. I would like to make a small income from my blog. I've just started affiliate links, but your advice about going back through old blogs is great, thanks for the tip! Really helpful post! Thank you. I'm just starting my blog so i'm heartened to see you think it's worth starting with Google Adsense even if your still under 1000 page views per month. Thanks for the advice! This was so helpful, saving to refer back to later... can't thank you enough!